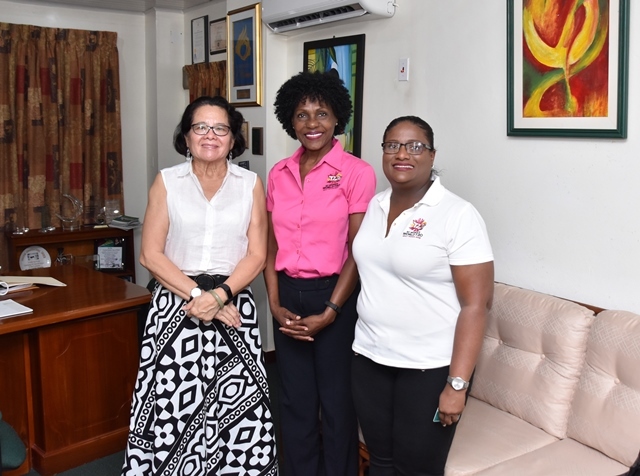 Georgetown, Guyana – (September 12, 2018) First Lady, Mrs. Sandra Granger, at the request of the International Cricket Council (ICC), has accepted the role of Patron of the first ever stand-alone Women’s World Twenty20 Tournament to be hosted from November 9-24, 2018. The First Lady today at her Office, met with the Tournament Director, Ms. Jennifer Nero and the Venue Manager, Ms. Sabrina Panday. From left, First Lady, Mrs. Sandra Granger, Tournament Director, Ms. Jennifer Nero and Venue Director, Guyana, Ms. Sabrina Panday.